The FBI recently raided the home and offices of Los Angeles City Councilman Jose Huizar as part of a probe into whether he and several other city officials received bribes from Chinese real estate developers for key projects in and around downtown L.A., according to a Jan. 14 investigative report by the Los Angeles Times. Four Chinese companies have in recent years won bids to some of the biggest real estate developments in L.A.: Shenzhen New World Group, Shenzhen Hazens, Greenland Holdings based in Shanghai, and Oceanwide Holdings based in Beijing. The Los Angeles Times reported on Jan. 14 that the FBI is seeking evidence of possible bribery, extortion, money laundering, and other crimes in these companies’ projects. Among the involved projects are Shenzhen New World Group’s plan to redevelop the 77-story L.A. Grand Hotel and build a new 31-story hotel near Universal Studios Hollywood; Greenland’s Metropolis project, which includes three condo towers and the Hotel Indigo; and Oceanwide’s construction of a new Park Hyatt hotel in the South Park neighborhood. Some of these projects have received taxpayer subsidies, such as Greenland’s Hotel Indigo, which received $18.7 million, according to the L.A. Times. 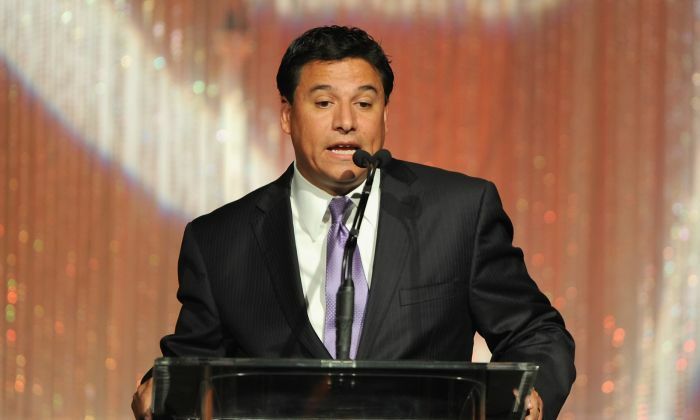 The key person in this probe is Huizar, the city councilman who represents the vast majority of downtown. Huizar headed the municipal council’s Planning and Land Use Management Committee for over five years. The Committee monitors all development projects in the city. The L.A. Times report cited a police warrant filed at a California federal court last November and two anonymous sources familiar with the FBI investigation. The Chinese real estate developers were subpoenaed by a federal grand jury to provide information on any contributions they made to Huizar’s reelection bid; donations to Huizar’s alma mater, the Bishop Mora Salesian High School; and funds to two political committees with ties to Huizar: the Community Support PAC and Families for a Better Los Angeles. The subpoena also requested that the developers disclose any gifts, meals, trips, vacations, flights, event tickets, rounds of golf, and other related entertainment that they provided to Huizar and his staffs, according to the two sources. The police warrant said investigators were also looking into whether Shawn Kuk, Huizar’s planning deputy, and George Esparza, Huizar’s former aide, committed crimes. The L.A. Times article clarified that the warrant did not say that the FBI has gathered evidence of criminal activity by any of the parties named in the document. Last November, the FBI had raided the offices and home of Huizar, who was removed from his position at the L.A. Planning and Land Use Management Committee following the raid. The FBI has yet to arrest or detain anybody in relation to the raid. Eric Garcetti, mayor of Los Angeles since 2013, and Joel Jacinto, who serves on the L.A. Board of Public Works and was appointed by Garcetti, are also being investigated, according to the warrant. Also named in the document as being under police probe is Ray Chan, former deputy mayor for economic development, who worked with Garcetti and headed the L.A. building department. Alex Comisar, Garcetti’s spokesman, denied the news when contacted by the L.A. Times. He said nobody in the mayor’s office was subject to federal subpoena, or even a formal request for information from the FBI. Herb Wesson, president of the L.A. City Council, and his chief of staff Deron Williams are reportedly under probe. But Ed Johnson, assistant chief deputy to Wesson, denied this. L.A. Councilman Curren Price is another key figure in the FBI probe, the L.A. Times report said. Price currently heads a council committee focused on economic development that decides how taxpayer subsidies are allocated to hotel developers. The FBI has not publicly confirmed the investigation. What Will the Chinese Regime’s New Anti-Corruption Body Do?